I absolutely love summer for being able to eat the most amazing and creative salad creations. It is just so refreshing and healthy! Lately I have been experimenting with cucumbers, as I feel like their neutral taste lets them mix perfectly with all kinds of different things. Thats why I came up with this delicious cucumber summer salad! 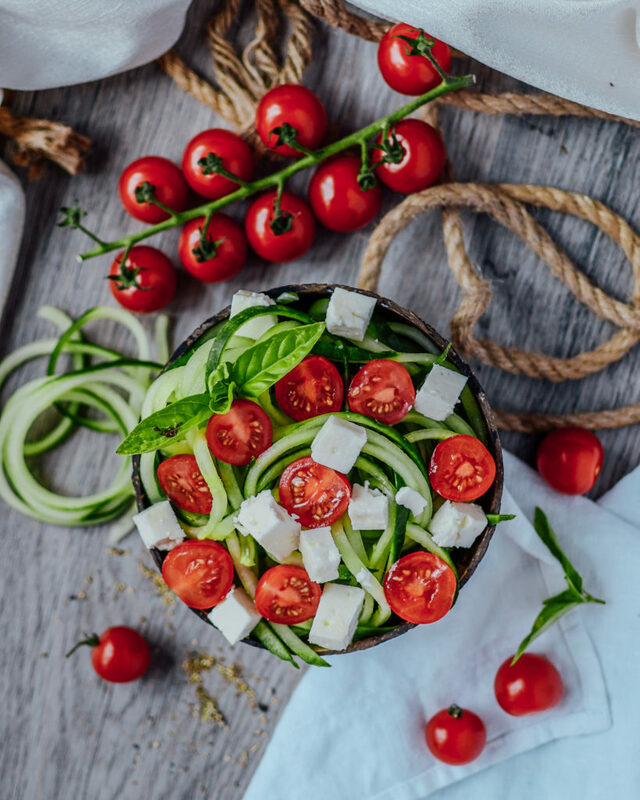 In this blog post you will find two of my new and favorite cucumber salad creations. They are both so extremely easy and fast to make, look beautiful and taste delicious. I found feta cheese to harmonize perfectly with the subtle sweet cucumber taste. 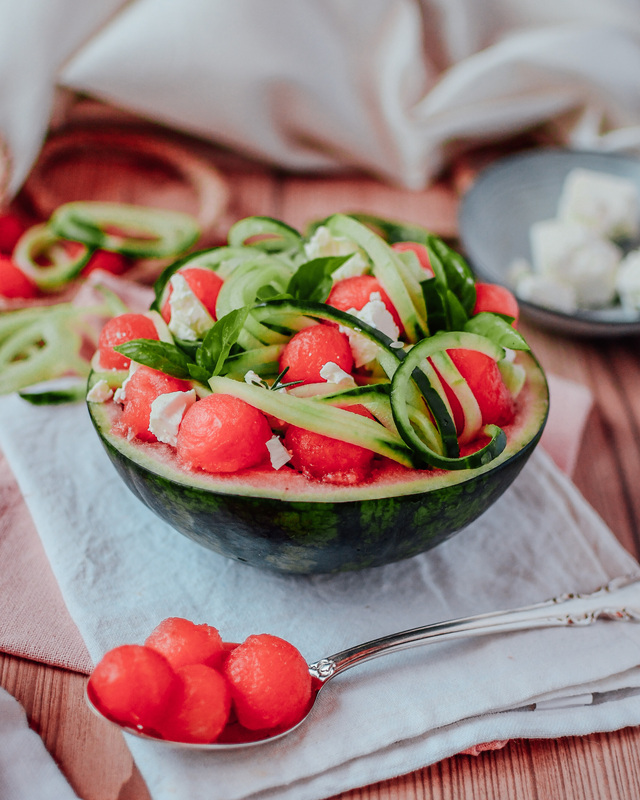 This creation is the perfect summer salad and the perfect addition to every lunch and dinner meal. 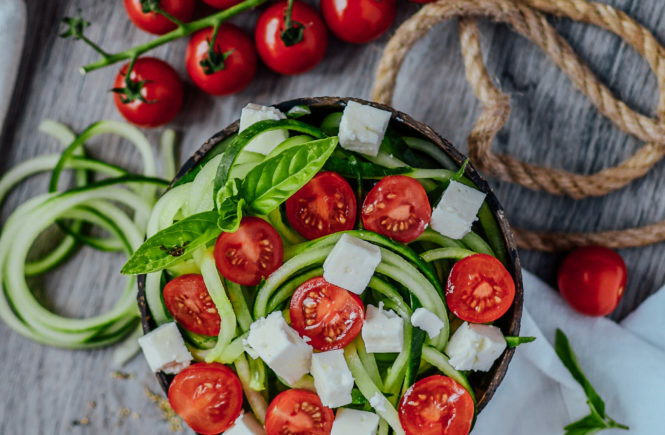 All you need is a cucumber, some feta and tomatoes. I used a spiralizer to make cucumber pasta – works amazingly well! Make sure to let the cucumber noodles sit for 15 minutes because they will loose a lot of water. Drain the noodles and mix them with tomatoes and feta. Regarding the dressing I always used simple balsamic vinegar, olive oil, salt and pepper. The second cucumber salad variation is very similar to the first one. The only difference this time is that I replaced the tomatoes with watermelon. I found this combination of sweet watermelon and tart feta cheese to taste extremely delicious. This is really the perfect summer salad with its tropical vibes and sweet taste. 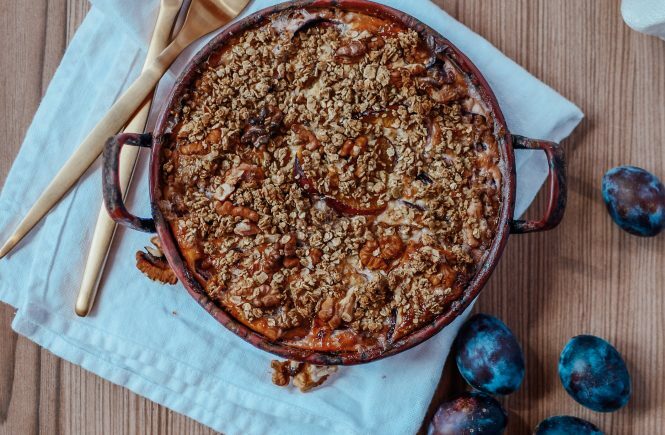 Now with the barbecue season this is really the perfect side dish to impress your friends with! Definitely something different and I think they would love it. So make sure to give it a try! Again all I did was mix 1 cucumber with 50g of Feta cheese and 100g of watermelon. Dressing was: white balsamic vinegar, olive oil, salt and pepper. I hope you enjoyed these light summery cucumber creations and will try making them yourself soon. 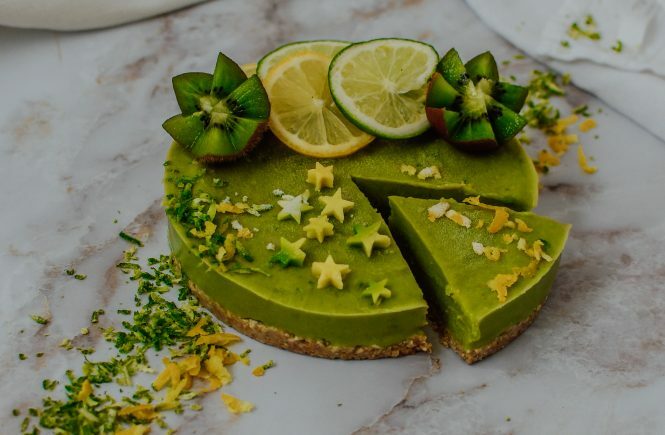 Avocado cheesecake – delicious raw and vegan recipe!